Green’s one-handed sledgehammer was the crowning moment of FilAm Sports USA’s emphatic 90-67 victory over Ateneo-Quezon City in the Supreme 16 phase of the tournament. With the win, the US team advances to the Fantastic 8 and inches closer to its goal of winning the national championship for high school presented Chooks-to-Go, Darlington-Exped Socks, EPSON, Huawei, Freego, Purefoods, Gatorade, Go for Gold, SM, Molten, and presented by 5Plus and Lighthouse Events. 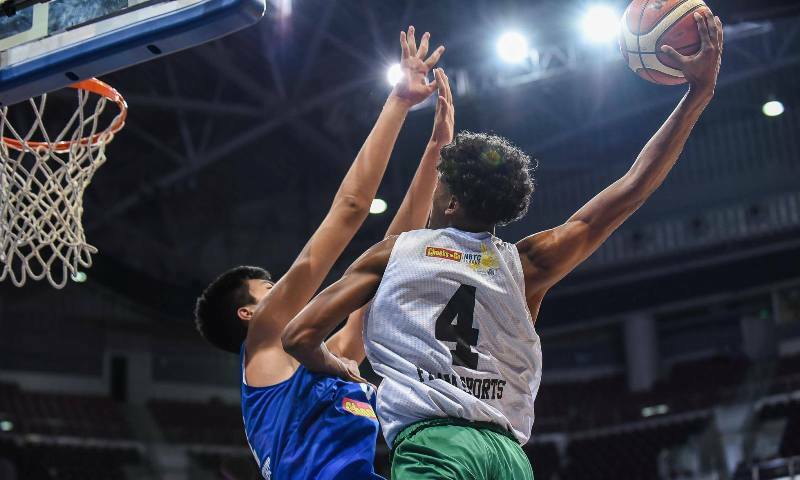 The 17-year-old Green got the better of the Blue Eaglets’ towering teen early in the second quarter as he drove baseline, met his defender at the rim, and delivered the vicious slam. He finished with a game-high 31 points and collected six rebounds, nine assists, and three steals. Aside from Green, forward Kai Ballungay also showcased his hops to end up with 16 points and nine boards. FilAm Sports shot 45 percent from the field while also doing damage at the defensive end, forcing Ateneo to 28 turnovers. “We came out and actually played hard from the jump. We played defense. We held them to [67 points]. We were playing together and the offense was flowing well,” Green added as he and his team led by as much as 32 points in the lopsided contest. USA now awaits the winner between San Beda-Manila and Southern Philippine Colleges-Cagayan de Oro to determine their matchup for the Fantastic 8. Sotto meanwhile did all he could with 24 points and eight rebounds. Forthsky Padrigao put up eight points, six boards, and six dimes, but was also unfortunately responsible for eight turnovers as Ateneo bowed out of the competition. Meanwhile, FEU-Manila got the better of NCAA champs Mapua-Manila, 67-58, to also advance to the next round. RJ Abarrientos led a balanced attack for the Baby Tamaraws with 10 points and seven rebounds. In the Supreme 16 of Division 2, Pampanga’s St. Agustine Institute of Pampanga walloped Zamboanga Del Sur National HS-Pagadian 83-47 and St. Mary’s College of Tagum blasted Dolores National HS-Eastern Samar with a 75-42 decision.